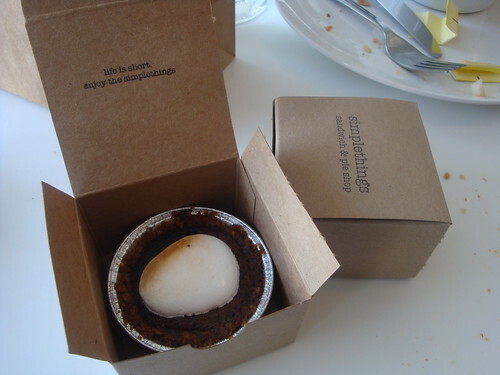 Simplethings Wins Sandwich Battle With Pie? There seems to be no shortage of newish, fancy pants, $10 sandwich shops in the Beverly Center/Melrose area of Mid City West, and all of them seem to have chosen a non-sandwich item to distinguish themselves from the fray. Potato Chips is an ok option (although I wish they made their own potato chips), and I’ve always been intrigued by the steak bomb at Soda Pop’s. But the latest entry into the “are these sandwiches really worth the money” sweepstakes has completely upped the ante. 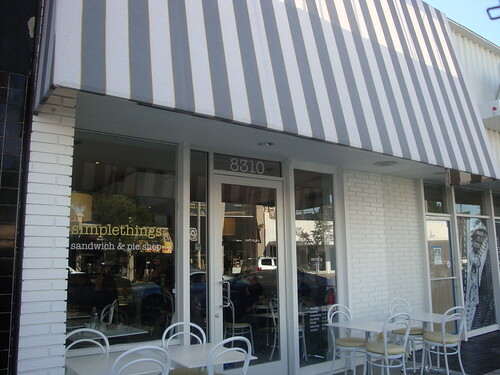 In fact, they may have won the game by virtue of their name alone: Simplethings Sandwich and Pie Shop. Because, quite frankly, how can soda or chips compete with pie. Answer: they don’t. It’s hard not to like the decor at simplethings. As promised, it’s simple and reminiscent of a time gone by, when fresh home-made pie was not considered a specialty of a diner or sandwich shop, but a requirement. Not that I would know anything about that. I was born in ’76, and have never lived in a small town. But it feels like that, so mission accomplished, I guess. 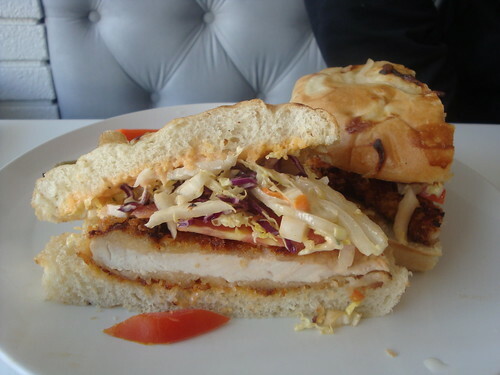 A bit on the small side, the fried chicken breast comes topped with coleslaw and a tobasco mayo. The foccaccia bread it comes on (from Il Dolce Forno in Culver City) was great, but seemed like a bit of a miss match with the chicken. It certainly didn’t taste bad, but if you’re hoping for a Bakesale Betty’ish gutbomb (like what the Animal boys served on the Cart For a Cause Truck back in April) or even the sandwich at Honey’s Kettle, you’ll probably be disappointed. The pulled chicken sandwich, on the other hand, knows no equal… at least in concept. I was a little confused at first by the chunks of chicken (expected it to be shredded) but at least it was moist and flavorful dark meat (bonus!) and the sweet BBQ’ish sauce paired nicely with the pickled onions. The pretzel bread was great, although once again it was a bit small for the price- especially because you don’t get anything on the side (except for 3 lightly pickled green beans and a similarly pickled carrot with each sandwich.) Next time I think I’ll definitely get the Thanksgiving Sandwich, which is clearly the most substantial option. They’ll do 1/2 a sandwich and a soup (or salad) for $10, which is kind of cool- especially because you can pick any sandwich on the menu. 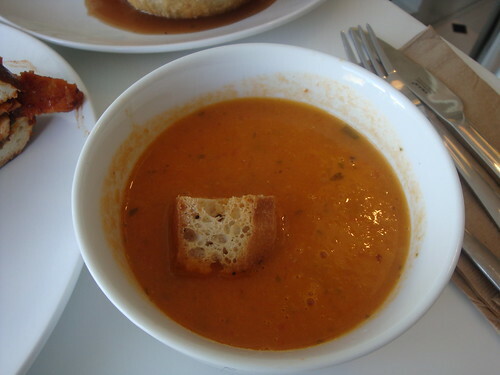 Their roasted tomato soup tasted super fresh, and warmed the belly nicely. 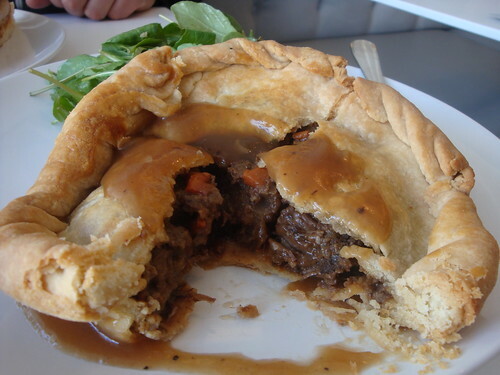 They have a pie schedule on their website, but seeing as the place is new, and many of the ingredients are seasonal, you might want to skip looking at the menu and just look at what they’ve got in the case up front. All of the pies are made fresh each morning, and available in single cutie ($2.50), simple ($5) and big ($20). As much as it pained me to order anything called “cutie”, I kind of love that they have a small and cheap option for those of us who like a little dessert after lunch but don’t want to spend $4 or $5 on a piece of pie. Seeing as the Missouri Mud pie is the only one on the menu every single day, I figured that was a safe choice, and it didn’t disappoint. It also makes for a good “cutie” order, with its cookie’ish crust- unlike the fruit pies which seem to be better suited for the “simple” size (the “cutie” sized fruit pies seemed to be overwhelmed by the crust.) And how can you go wrong with a homemade marshmallow. So good. All in all Simplethings is a great lunch option for the hood, and the prices seem in line with the area. 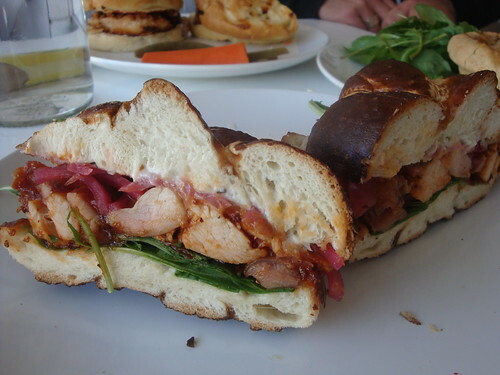 And there’s no question the sandwiches are expertly crafted, and use great ingredients. Though the sandwiches alone are a bit small to warrant a special visit from this fat guy. Thankfully the amazing pies are there to pick up the slack. I don’t mind paying $10 for an expertly crafted sandwich, with the best ingredients. You get what you pay for! Damn that bread is good. 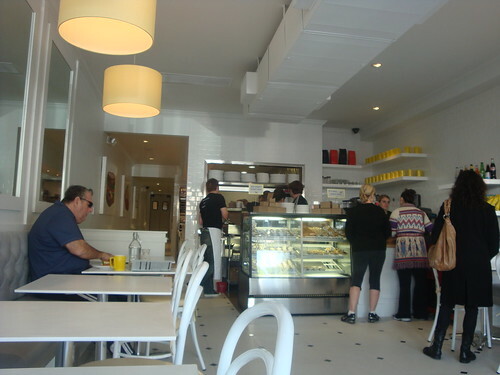 How have I never been to Il Dolce Forno Bakery? I don’t need a huge lunch. These sandwich were the perfect size. Ooooh… pot pies too? Nice. Did I mention I love pie? The fried chicken sandwich was no Bakesale Betty’s! Did I mention the sandwiches are a bit too small? Posted by Zach Brooks at 11:45 am, December 2nd, 2010 under Mid-City/Miracle Mile, Sandwiches, Sweets, West Hollywood.